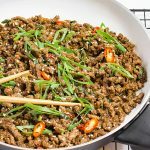 Sweet, spicy and salty, our Sticky Korean Stir Fry is an easy keto ground beef recipe with a delightful mix of flavor from Asia. In a mixing bowl, add all the sauce ingredients and whisk together. Set aside. Place a large non-stick frying pan or wok over high heat. Add the sesame oil, garlic, chili and onion and stir fry for 2-3 minutes, until fragrant. Add the ground beef and stir fry until browned. Pour over the sauce and simmer until it has reduced and thickened, coating the ground beef. Remove from the heat and mix through the scallions and sesame seeds. Serve immediately with a side of Cauliflower Rice.